We praise the Lord for the various ways that He shows himself through special moments, etc. in the middle of processes and/or difficult challenges that take time. We absolutely know, as it says in James 5:16, that The prayer of a righteous man is powerful and effective—those that seek, know, and follow God and go to him in prayer because they know that He truly is the One, True Source of Answers and Solutions. He is responding to all of our prayers, and we can see it and feel it, not just here, but also with people that we pray for in other places. Those powerful and effective prayers seem to always bring special moments with them as God responds and continues to work out his good and perfect will. Millarai is doing better and is able to live outside of the hospital while awaiting her surgery to remove the cancerous tumor from her knee. She and “Mama” Gilda have even been able to go back to Antofagasta in northern Chile until May 5. Milla’s surgery is scheduled for May 7. 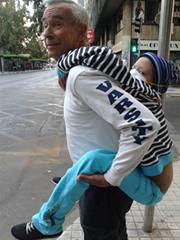 The below picture is Jack carrying her to a cab after our taking her to a movie in Santiago. She just didn’t have the strength to walk a full block. It was a great outing and one of those good, special moments mentioned above. o Her continuing to gain strength for the surgery and that she would remain healthy for it. o For their time in Antofagasta. Gilda’s family is going through some difficult relational problems, in part due to her needing to live here in Santiago with Milla for such a long time. o That they would feel God’s presence and grow closer to Jesus through this experience. o She will need more blood donors, giving thanks, too, that many have come forward. –Pray for our on-going board meetings, specifically for meetings with Juan Pablo, who would like to fill the director position. We need to come to realistic expectations with regard to what that job will entail, including before new children begin to arrive, and also agree on a salary that we can commit to. With that in mind, we hope that he is the person for the job. –Pray that our current mission property maintenance & improvements, and house cleaning & painting, etc. will continue to move forward well during May. We would like to finish readying for children house #3 (currently vacant) this month. House for Swansons We continue to look for a house to rent or buy (given the availability of borrowing funds in the States). We need to move before new children can be accepted. Land south of Santiago for children’s camp/teaching center Pray that our on-going initial conversations with the Chilean family with 20 acres of property near Concepción lead to agreement in terms of vision for and design of the property. They would be donating the land and also continue as part of the directing ownership group to ensure the fulfillment of that vision. We would like to reach general agreement on these matters this month. We will also be revisiting the property with them and with others in May. Valparaiso, Chile fire Over 2,000 poor to modest homes were destroyed three weeks ago by the worst fire in the history of the city. Many have responded, but many remain in tents as rains begin.